You may have heard the cries of “Gretchen? Seriously?” coming from my house during the PR finale. I mean, I will say that her aesthetic appeals to me to a certain point – I like long flowy dresses, layering etc. But I hated the colors (so much brown!) and it didn’t excite me… it did not deserve to win, and I lost a whole lot of respect for Michael Kors and Nina Garcia. Going to a casual party, this was my idea of a good outfit to wear for wine and gossip. It was very comfortable. 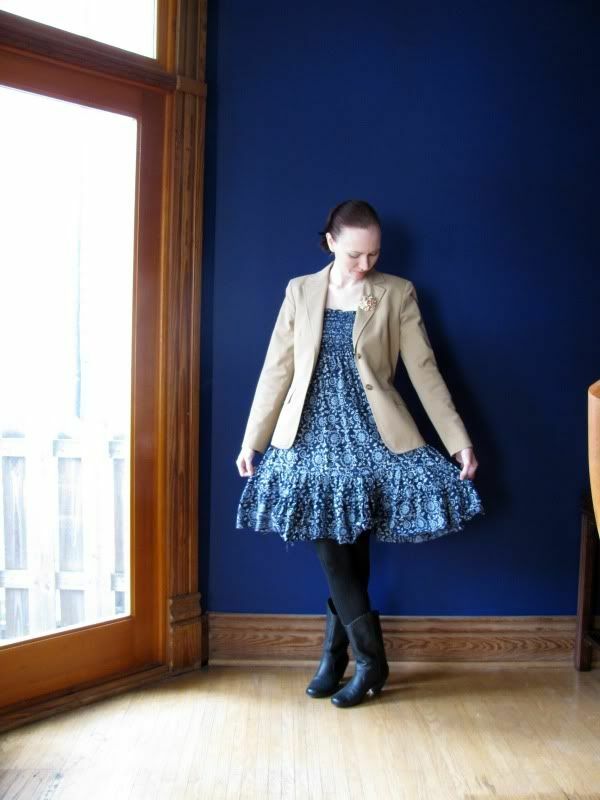 This dress was taken in and shortened – I really love it now, especially with the leggings. It’s very comfortable. I have a really similar Vogue pattern, and I’m thinking of making up my own version. I’m thinking of hemming this dress an inch or two shorter and wearing it as a tunic. For some reason I don’t love it as a dress like this, only over leggings. Another thrifted jacket – lately I’ve been having great jacket luck. Last night I found a gorgeous Maggy London Tuxedo jacket with a sequinned collar (which goes into my performance clothes closet) and a 60s houndstooth jacket. Of course, I don’t have a chic little cropped leather jacket (though now I want one!) I’m actually surprised by how much I like this look – it’s more boho than I usually do, but I quite like it! I just adore the hounds tooth Jenny with the polka dot tights. Love love love!!!! Love your outfits.. Where did you find the houndstooth for your jenny skirt? I haven’t been able to find any..
OK, bit of a lurker, here, coming out of the ether. I just can’t get over how cute all your dresses are! I’m a pants-all-the-time kind of girl, rather a tomboy. Anything that looks like a skirt is probably skorts, if I’m wearing it! I love the look of dresses and skirts, but never really wear them. Anyway, just wanted to say that you’re inspiring me to sew again, with all your wonderful Wednesday posts. Thanks fo0r the inspiration and the tips on great places to browse for ideas. I’m afraid I’ve been too…generic…too long. Especially if you knew me in college! 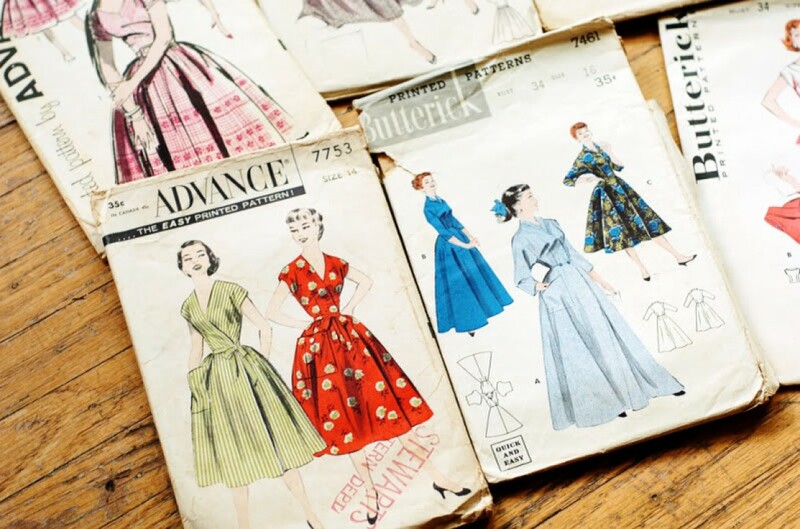 Thanks for sharing your wonderful creativity – I look forward to all your sewing posts. Love your outfits, especially the first one with the pink skirt and polka dot tights. I think the last dress would look better if you cut off the bottom ruffle? That’s just me. Love your style and the fact you wear what you love. If teachers here in Australia wore your style, I would be thoroughy impressed. It’s all jeans here I’m afraid. I actually agree with you about the ruffle, but unfortunately the ruffle is long enough that it would be an awkward length without. If I make a maxi dress I’m definitely no ruffle, like the inspiration photo. I would love to know how you manage to store all your clothes! I don’t consider I have lots of clothes by any stretch, but I do sometimes forget what’s in the closet and wonder how you keep track of it all. Also how do you decide what will go with what? Do you decide your outfit the night before? I have a walk-in closet (I plan to never be without one again!) I organize all my clothes by type – long sleeve tops, short sleeve tops, cardigans, jackets, pants, skirts, and dresses. I keep the things I’ve made or altered in their own section, because I try to wear them more often. I usually decide on the main piece (skirt or dress usually) the night before, and then end up trying a few different things with it in the morning. I work at home though, so I have plenty of time to figure it out. I have a lot of jackets, scarves, cardigans etc because I get bored if I wear the same thing too much. Wearing dresses all the time is actually easier – less things to coordinate! I probably don’t have as many clothes as it seems, because since most of my clothes were thrifted I’m pretty ruthless about getting rid of things that aren’t working. But it’s a constant struggle to stay organized! My sister shared your blog with me last week and I am addicted! I love your sense of style. After reading your blog I hit the thrift store with a whole new set of eyes. I scored a great sweater, cardigan and shirt that I never would have checked out before. Thanks for the inspiration. Keep it up! I love that long dress for the fall! I’ve been struggling with how to pull off this style. I really like the way you did it. And just exactly how is a music teacher “supposed” to look? I think you look fabulous. Your choices show personality and thought. Too many people out there are just cookie cutter versions of the same thing. Love that last outfit – very nice! Oh no! Now you´ve got me wanting a little cropped jacket too;-). And by the way, I´m a music teacher too, and I´ve heard that we are supposed to look somewhat “creative”, so no stress. Wear what you want – you look great! Great outfits, especially the first pink and black one — love the skirt and tights! I totally agree on the outcome of Project Runway and cannot believe Gretchen won. Cannot! Frankly, I never got past her mullet hairstyle right from the get go. Mondo (isn’t that the best name for a clothing line?) got ripped big time. You’re always so put together. I know this is one of the things you’ve been working on, so… great job! 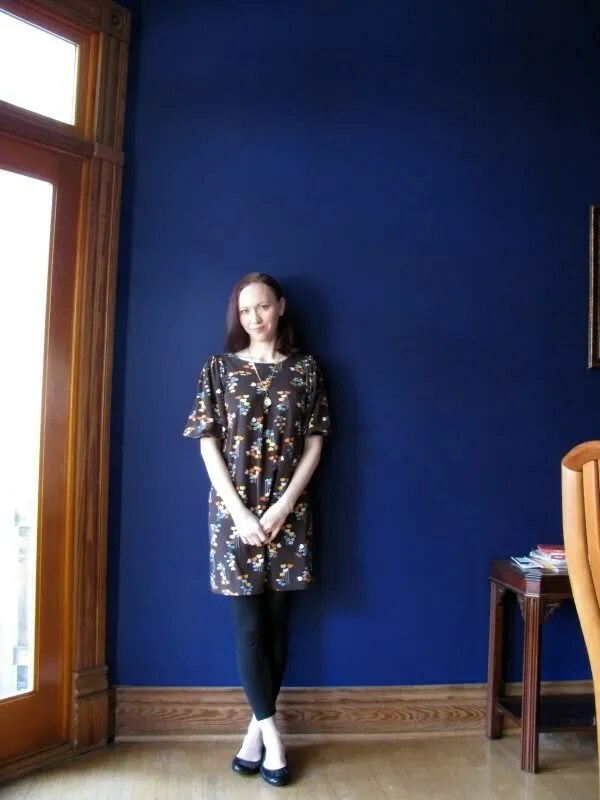 And I just have to say how much I love that blue wall.